November 22,2015 Duncan, BC (ISN) – The midget division Victoria Spartans were defeated the Cowichan Valley Timbermen 20-15 on a last minute TD to close out regular season play in the Vancouver Mainland Football League Sunday at McAdam Park in Duncan, BC. 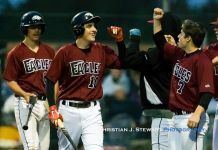 For the elder Spartans, sitting in third place with a 7-2 record going into the contest, nothing could be taken for granted as the Spartans looked for a regular season win combined with a North Surrey Bears in hopes of securing a home field playoff game next weekend. 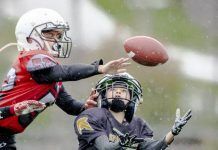 The Cowichan Valley Timbermen, in a rebuilding season, came into their final game of season with a respectable 3-6 record, good enough for sixth place in the nine-team league. For the Timbermen in their final game of the season, most might have thought a loss to be a forgone conclusion, however the Cowichan team had higher aspirations of how they wanted to finish their season. 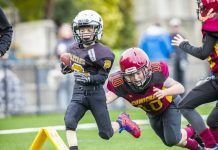 After last weekend’s 25-7 loss to the Langley Stampeders, the Spartans were looking to get off on the right foot in Duncan. And that they would, as the Spartans would assert themselves on the ground with the legwork of Jacob Arnaud. Arnaud would prove valuable in the Spartans offense breaking tackles for extra yards to keep play predominately on the Timbermen’s side of the field in the opening quarter. The Spartans would jump out to a first quarter 7-0 lead on 5 yard TD catch and run play by receiver Alec Mackenzie from QB Brandon Holland. Running back Jake Borserio would lead the Timbermen charge with hard fought yards on the ground all game long for his Cowichan side. Despite some aggressive Timbermen tackling up the middle, the Spartans QB Brandon Holland would find Bailey MacMillan through the air for a thirty-yard catch to set up an eventual running TD by Aidan Morton-Smith to put his team comfortably up 14-0. The Timbermen would finally find their stride late in the half when receiver Kain Melchior would provide a spark, pulling down a miraculous sideline catch from QB Braemon Conville to put the Spartans back on their heals with two minutes remaining in the half. Running back Borserio would carry the ball for his team’s first TD with less than a minute remaining in the half. An unsuccessful attempt for extra points would leave the score 14-6 at half time. The Timbermen’s defense would step up their play in the second half, forcing two key interceptions and a QB ball miscue, to take favorable field position from the Spartans. The Timbermen defense would hold the Spartans to a single point in the second half, the point coming on a Spartans missed field goal attempt. The Timbermen, keeping pace with the Spartans much of the second half would save their best for the last three minutes of the game. RB Borserio, set up on the 18-yard line, would run for his second visit to the house to bring the Timbermen near. A successful attempt for extra points would make the score 15-14. The Spartans, electing to look down field for a reply would offer up Holland’s second interception when a Timbermen defensive secondary would step in front of the Spartans pass, down field to Hayden Crothers, in a great defensive play to regain possession. With less than 2 minutes remaining, the Timbermen would back the Spartans down field with a strong running game. Timbermen QB would find receiver Melchior again, splitting the defense on a fantastic route over the middle to connect from twenty-two yards out for what would be the winning, come from behind TD catch. The Spartans getting one last chance of their own would be stalled once again by the Timbermen defense, turned aside on downs at the Timbermen 30 yard line. The Cowichan Valley Timbermen would close out their season with a 20-15 win over the playoff-bound Spartans. Despite their 3rd straight loss, the Victoria Spartans will now regroup and look to the playoffs against the Langley Minor Football Stampeders, November 29th, at McLeod Stadium in Langley.